The gloves came off a bit at the most recent Navajo Nation presidential candidates' forum, with Carrie Lynn Martin taking a swing at fellow thirty-something Moroni Benally over his proposal for the Navajo Nation to demand full control over all its land and resources. Martin, 37, of Bodaway/Gap, Ariz., said to do that would be to sacrifice the majority of the Navajo Nation's budget, which comes from federal appropriations. "Then we're by ourselves," she said. "We're left with nothing." "Our sovereignty is not nothing," Benally, 35, shot back in answering a different question. Martin got a chuckle from the audience when she quipped that Benally "will make a great secretary of labor." (How much to rely on the federal government is a key issue dividing the candidates. Donald Benally and Kee Yazzie Mann, for example, advocated lobbying for more federal dollars instead of fewer, with Mann stating that if elected he would press the feds to "match dollar for dollar" the recent $554 million settlement for mismanaging Navajo assets.) As in the previous three forums sponsored by the Navajo Times and KTNN-KWRK, candidates were not allowed to address each other directly, merely to answer questions posed by panelists chosen to represent different facets of Navajo society. But the audience had more opportunity to compare and contrast candidates this time because, in the third and fourth rounds of questioning, the same question was posed to each of four candidates. With names drawn at random, Martin and Moroni Benally twice ended up in the same quartet of respondents, allowing Martin to distinguish herself from the other youthful contender. In honor of the venue -- Monument Valley High School in Oljato, Utah -- many questions focused on the oft-forgotten Utah Navajos, leaving contender Kenneth Maryboy -- who represents the Utah chapters on the Navajo Nation Council -- with a distinct advantage as he has been working on the area's issues for years. In response to a question on the proposed Diné Bikeyah Conservation Area, for example, other candidates waxed wary of giving up any Navajo land while Maryboy, who helped engineer the proposed land trade, was able to point out that it would actually grow the Navajo Nation. Some candidates had obviously done their homework, however. Russell Begaye of Shiprock commended the Utah Navajos for successfully suing the San Juan School District in order to get the high school built on the reservation, and Donald Benally, also of Shiprock, recognized 97-year-old medicine man John Holiday in the front row. Navajo Times Editor Candace Begody posed a question on how to allow development within Monument Valley Tribal Park, where residents have said they feel like they're in a "cultural zoo" because of regulations against overhead wires and other view-ruining infrastructure. Donald Benally and Joe Shirley Jr. (under whose administration The View Hotel was built) both thought some of the money collected from tourists should be pumped back into housing and infrastructure, but Dale Tsosie of LeChee, Ariz., cautioned that any development should enhance rather than detract from the natural beauty of the area, lest tourists take their business elsewhere for a more pristine view. Incumbent President Ben Shelly called the question "embarrassing." "You're not the forgotten people," he told the Monument Valley residents in the audience. "The real forgotten people are those people who are in wheelchairs" or who have other disabilities. He noted that many tour guide operators have been able to make a good living from Monument Valley, and its inhabitants don't have to wait for the tribe to do something for them. Asked who should manage the Utah Navajo Trust Fund, Moroni Benally drew enthusiastic applause when he said it ought to be in the hands of the people most affected by the oil and gas drilling that creates the revenue for the trust. (Shelly has advocated for tribal investment of the fund but local administration.) Asked by Navajo Nation Council Delegate Jonathan Nez (Shonto/Navajo Mountain/Oljato/Ts'ah Bii Kin) why Utah doesn't have any Navajos in its statehouse, Navajo Nation Election Office Director Edison Wauneka said it's because Navajos don't vote as a block, don't partner with other Indian tribes to increase their influence, and don't tend to vote in state elections (although both Arizona and New Mexico have Diné representatives). As time winds down toward the Aug. 26 primary election, the questions seemed a little more pointed than they have at previous forums in Tuba City, Shiprock and Crownpoint. Dee Yazzie of KWRK point-blank asked Donald Benally what he thought of "felons holding office," a thinly veiled reference to Benally's own 10 years behind bars in the aftermath of the Peter MacDonald riots of 1989. Benally recognized the barb and faced it squarely, explaining in Navajo that he never thought of himself as a felon any more than his grandmother was a felon for trying to resist the Long Walk. "I was standing up for the leadership of the Navajo Nation," he told the several hundred people in the packed, sweltering auditorium. Candidates floated some innovative ideas that have not surfaced at previous forums. 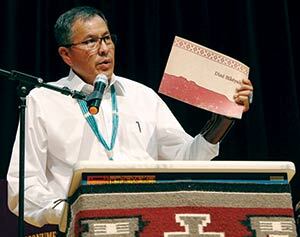 Maryboy, for instance, posited a Navajo National Guard to transition veterans into civilian life; for language preservation, Shirley considered a Diné Language Lab similar to what the Mormons use to train their missionaries; Begaye wants to see exercise rooms in every Navajo Nation office so the tribal employees can set an example of good health. Begody asked Christopher Deschene, a former Coconino County attorney, if the recent murder of two homeless Navajo men in Albuquerque should have been prosecuted as a hate crime. "The Albuquerque district attorney got it wrong," Deschene stated. "This is a human rights issue." Deschene said that, if elected, he would liaise with the border towns on how to handle the problem of homeless Diné who find their way there. Asked how he would reorganize the Navajo Nation Department of Justice, long derided as a bottleneck for projects and legislation, Shiprock Chapter President Duane "Chili" Yazzie said he would "tell all of the non-Diné attorneys that we want their resignation letters on our desk today." A question on whether the Diné Marriage Act of 2005, which bans gay marriage, should be repealed seemed to fluster the quartet of candidates to which it was posed, with only Shirley, who had vetoed the act as president (only to watch the Council override his veto) saying clearly he believed the government should not interfere in interpersonal relationships. Candidate Hank Whitethorne of Shonto, Ariz., blamed homosexuality on eating too much hormone-laced beef, while Wauneka said the question "has to do with Heavenly Father" and said he would uphold the law. Maryboy, while stating overturning the law should be the people's decision, also cited traditional teachings that male and female each have their role in society and should stick to it. A question from Nez as to whether the revenue from the Utah water settlement was apportioned fairly gave candidates a chance to grandstand on water rights. "Why do we always have to bend down for the people in the big cities?" asked Dan Smith of Shiprock. "That thing needs to be taken back." 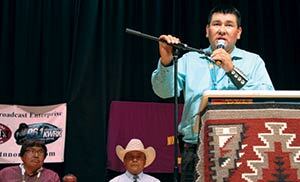 "We will no longer be bullied by the federal government," said Myron McLaughlin of Chinle. Panelist Nelson Yellowman, who sits on the governing board of the San Juan School District, wondered if the Navajo Nation should go to a two-party system "so we don't have this type of situation" with 17 candidates running for president. Martin said she didn't see a problem with a huge field to choose from. "At least if there's 17 running, hopefully we'll have some honest people in the crowd, right?" she quipped. Moroni Benally, who taught political science at the University of Washington, said there are pros and cons to a party system, but ultimately "it subjects you to all sorts of corruption within the party itself." Donald Benally used the political question to blast Title II, which 25 years ago balanced power between the three governmental branches. And Duane "Chili" Yazzie used it to promote the complete destruction and replacement of the Navajo Nation government he has been advocating at every forum. "I do not believe in government reform," he said. "It's a manipulation of the same old system that the colonialists imposed on us 91 years ago." As they have at every forum, current and previous leaders touted their experience while newcomers to politics like Cal Nez (who came late because he was replacing campaign signs somebody tore down) bragged about being businesspeople rather than politicians. Edison "Chip" Begay, a retired mine manager making his first foray into politics, said he was tired of listening to Shelly and Shirley recount their accomplishments. "How many terms is it going to take for them to correct our problems?" he asked. "The reason we have 17 people running for president," echoed McLaughlin, "is the last 12 years." 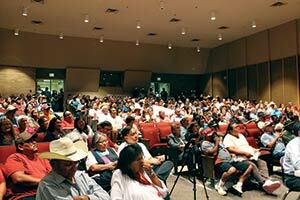 The next and final forum will be Monday, Aug. 18 at Red Rock Park in Gallup. The event is free and everyone is welcome.